Join any of our four interdisciplinary pop-up digital maker gatherings. At the centre of the event will be a large participatory digital maker base camp, a space to develop agile and experimental projects led by members of the Collective. Explore anything from virtual, mixed/augmented reality and virtual/real interventions, to creating artificial creatures and utopian or dystopian worlds. 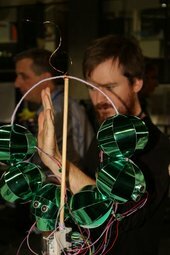 Use sensors, microcomputers and biofeedback devices to create interactive objects and digital interactions. 8 February: Pop-up 1 – Digital New and The Familiar: How do we reconcile digital unknowns with the everyday?